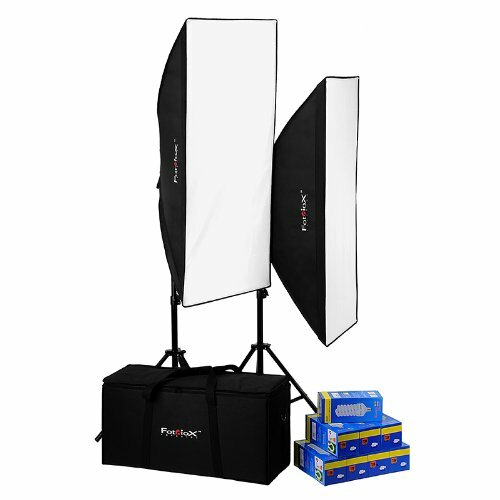 The Fotodiox Pro Compact Fluorescent 2-Light (8 Bulb) Light Kit is a perfect addition for any videographer who needs a broad lighting solution, or photographers who need a quick setup for location shoots. The Compact Fluorescent Kit features a 4-bulb light fixture head that accepts standard screw base light bulbs. The fixture has two switches on the back that turn on or off two of the bulbs at a time to fit your lighting needs. The fixtures also have built-in points for direct attachment of each included softbox, no speedring is necessary. The softboxes add versatility to the light emitted from the fixtures; the silver interior intensifies, and the front diffuser softens the light. The diffuser is made out of ripstop nylon, which not only makes it harder to rip or tear, but also helps diffuse the light more evenly. The front diffuser is removable to enable a softer or harder lighting effect. The heavy duty light stands rise to a maximum height of six feet (6'). The two light compact fluorescent kit is rounded out by all the necessary fluorescent bulbs and a carrying case, which makes transport and storage easy. This kit is equally useful for photo and video work. This kit creates an extremely easy-to-use yet effective light setup. This all-in-one kit comes with its own carrying case for ease of portability. This is a must have for videographers and photographers alike!